It can be easy to say to yourself, "I'll just take a quick look at Facebook" and then look up at the clock to realize you've wasted twenty minutes sharing memes for or against a political stance. Dayboard is a Chrome extension that can help you avoid falling into the trap of opening a new tab just to "take a quick look" at something on social media. 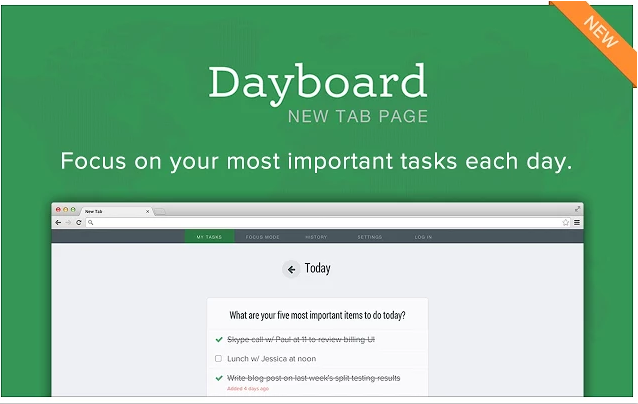 Dayboard is a free Chrome extension that opens your daily to-do list every time you open a new tab in Chrome. When you open a new tab for the first time Dayboard will appear and ask you to enter your to-do list for the day. After creating your to-do list for the rest of the day whenever you open a new tab you will see your list. You can place a checkmark next to items as you complete them. Dayboard is the kind of to-do list that I need and that I am sure many students can benefit from using too. I often find that I lose momentum on my to-do list when I start switching between tabs. Having my to-do list appear instead of the default "most visited sites" tab appear in Chrome should help me stay on task. I'm sure that it will help some students stay on task too.